The roc appears in Arabic geographies and natural history, popularized in Arabian fairy tales and sailors' folklore. Ibn Battuta tells of a mountain hovering in the air over the China Seas, which was the roc. The popular story collection One Thousand and One Nights includes tales of Abd al-Rahman and Sinbad the Sailor, both of which include the roc. The English form "roc" originates from Arabic ruḵḵ (Arabic: الرُخّ‎, translit. ar-ruḫḫ) and that from Persian ruḵ. In both languages, Arabic and Persian, the word is written in Arabic alphabet as رخ. Common romanizations are ruḵḵ for the Arabic form and ruḵ, rokh or rukh for the Persian form. According to Rudolph Wittkower, the idea of the roc had its origins in the story of the fight between the Indian solar bird Garuda and the chthonic serpent Nāga. The mytheme of Garuda carrying off an elephant that was battling a crocodile appears in two Sanskrit epics, the Mahabharata (I.1353) and the Ramayana (III.39). 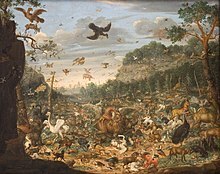 1690 painting by Franz Rösel von Rosenhof showing two roc-like birds carrying a deer and an elephant; a third grasps a lion. Rabbi Benjamin of Tudela reported a story reminiscent of the roc in which shipwrecked sailors escaped from a desert island by wrapping themselves in ox-hides and letting griffins carry them off as if they were cattle. It was for all the world like an eagle, but one indeed of enormous size; so big in fact that its quills were twelve paces long and thick in proportion. And it is so strong that it will seize an elephant in its talons and carry him high into the air and drop him so that he is smashed to pieces; having so killed him, the bird swoops down on him and eats him at leisure. Polo claimed that the roc flew to Madagascar "from the southern regions", and that the Great Khan sent messengers to the island who returned with a feather (likely a Raphia frond). He explicitly distinguishes the bird from a griffin. In The Arabian Nights the roc appears on a tropical island during Sinbad's second voyage. 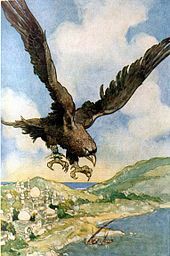 Because of Polo's account, others identified the island as Madagascar, which became the location for stories about other giant birds. Doubtless, it was Polo's description that inspired Antonio Pigafetta, one of Ferdinand Magellan's companions, who wrote or had ghost-written an embroidered account of the circumglobal voyage: in Pigafetta's account the home grounds of the roc were the seas of China. Such descriptions captured the imaginations of later illustrators, such as Johannes Stradanus ca 1590 or Theodor de Bry in 1594 who showed an elephant being carried off in the roc's talons, or showed the roc destroying entire ships in revenge for destruction of its giant egg, as recounted in the fifth voyage of Sinbad the Sailor. Ulisse Aldrovandi's Ornithologia (1599) included a woodcut of a roc with a somewhat pig-like elephant in its talons, but in the rational world of the 17th century, the roc was regarded more critically. The scientific culture of the 19th century introduced some "scientific" rationalizations for the myth's origins, by suggesting that the origin of the myth of the roc may lie in embellishments of the often-witnessed power of the eagle that could carry away a newborn lamb. In 1863, Bianconi suggested the roc was a raptor (Hawkins and Goodman, 2003: 1031). Recently a giant subfossil eagle, the Malagasy crowned eagle, identified from Madagascar was actually implicated as a top bird predator of the island, whose megafauna once included giant lemurs and pygmy hippopotamuses. Another possible origin of the myth is accounts of eggs of another extinct Malagasy bird, the enormous Aepyornis elephant bird, hunted to extinction by the 16th century, that was three meters tall and flightless. There were reported elephant bird sightings at least in folklore memory as Étienne de Flacourt wrote in 1658. Its egg, live or subfossilised, was known as early as 1420, when sailors to the Cape of Good Hope found eggs of the roc, according to a caption in the 1456 Fra Mauro map of the world, which says that the roc "carries away an elephant or any other great animal". 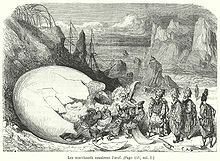 Between 1830 and 1840 European travelers in Madagascar saw giant eggs and egg shells. English observers were more willing to believe their accounts because they knew of the moa in New Zealand. In 1851 the French Academy of Sciences received three eggs. They and later fossils seemingly confirmed to 19th-century Europeans that Aepyornis was the roc, but the real bird does not resemble an eagle as the roc is said to. Another rationalizing theory is that the existence of rocs was postulated from the sight of the African ostrich, which, because of its flightlessness and unusual appearance, was mistaken for the chick of a presumably much larger species. Ostriches, however, were already well known in Biblical times. [verification needed] On the other hand, a medieval Northern European or Indian traveller, if confronted with tales about ostriches, might very well not have recognized them for what they were (compare History of elephants in Europe). In addition to Polo's account of the rukh in 1298, Chou Ch'ű-fei (周去非, Zhōu Qùfēi), in his 1178 book Lingwai Daida, told of a large island off Africa with birds large enough to use their quills as water reservoirs. Fronds of the raffia palm may have been brought to Kublai Khan under the guise of roc's feathers. Some recent scholars[who?] have compared the legendary roc with the Haast's eagle, of New Zealand. 1.4 m (4 ft 7 in) long with a 3 m (9.8 ft) wingspan, it became extinct around the 15th century, but probably inspired the Māori legend of Te Hokioi or Te Hakawai. This was said to be a colorful huge bird which (in some versions of the legend) had occasionally descended to Earth to carry off humans to eat, but generally lived in the clouds unseen. Only its cry, after which it was named, could be heard. Indeed, the hokioi seems to be a composite mythical beast inspired by actual animals, just like the roc appears to have been. In the 1980s, it was found that male Coenocorypha snipes, tiny nocturnal waders, produce an unexpectedly loud roaring sound with their tails during mating flights. The supposed coloration of the hokioi is not matched by any known bird, and generally would be extremely unusual for a bird of prey. Thus, as it seems likely that the hokioi was the eerie "drumming" of the snipes, explained with the ancestor's tales about the giant eagles which they still knew from living memory. Whose severall species were too long to name. The rukh is also identified in the Ethiopian holy book Kebra Negast as the agent responsible for delivering the blessed piece of wood to King Solomon which enabled the great king to complete the Temple. This piece of wood also is said to have transformed the Queen of Sheba's foot from that of a goat to that of a human. The piece of wood that the rukh brought was therefore given an honored place in the Temple and decorated with silver rings. According to tradition, these silver rings were given to Judas Iscariot as payment for betraying Jesus; the piece of wood became Jesus's cross. The roc appears in several different film adaptations of the adventures of the hero Sinbad, most notably in the film The 7th Voyage of Sinbad (where it is depicted as a two-headed condor), and the 2003 animated film Sinbad: Legend of the Seven Seas, where it instead resembles snowy owl but with claws on its wings like a hoatzin. Decoration outside of Nadir Divan-Beghi madrasah, Bukhara, representing a Simurgh. Simurgh from the works of Attar of Nishapur. The ancient story of the Persian amrzs, (or slnamurv in the Minoi-khiradh), an immortal bird which shakes the ripe fruit from the mythical tree that bears the seed of all useful things. The garuda on which Vishnu rides is the king of birds. In one story, the Simurgh takes the place of the garuda. The Ziz or Bar Juchne of Jewish tradition. The Thunderbird of Native American tradition. ^ Noted in Yule-Cordier, Cathay and the Way Thither IV (1916:146), noted by Wittkower 1938. ^ Wittkower noted the identification of the roc and Garuda made in Kalipadra Mitra, "The bird and serpent myth", The Quarterly Journal of the Mythic Society (Bangalore) 16 1925-26:189. ^ M. Komroff, Contemporaries of Marco Polo 1928:311f. ^ a b c d Ley, Willy (August 1966). "Scherazade's Island". For Your Information. Galaxy Science Fiction. pp. 45–55. ^ An engraving after Stradanus is reproduced in Wittkower 1938:fig 33c. ^ Illustrated in Wittkower 1938:33, fig. b. ^ Tyson, Peter (2000). The Eighth Continent. New York. pp. 138–139. ^ Needham, Joseph (1971). Science and Civilisation in China. Cambridge University Press. p. 501. ISBN 9780521070607. ^ Major, Richard Henry (1868). The Life of Prince Henry of Portugal Surnamed the Navigator, and Its Results, Comprising the Discovery, Within One Century, of Half the World ... from Authentic Contemporary Documents. Biblioteca Nacional de Austria - Asher (Editor). p. 311. ^ "Job 39:13-18 - "The wings of the ostrich flap joyfully, though...NIV". Bible Study Tools. ^ Pearson & Godden (2002). In Search of the Red Slave. p. 121. ISBN 0750929383. ^ Yule's Marco Polo, bk. iii. ch. 33, and Academy, 1884, No. 620. ^ Attenborough, D. (1961). Zoo Quest to Madagascar. Lutterworth Press, London. p.32-33. ^ "New Zealand Birds". Retrieved 2010-07-09. ^ Drayton, Michael (1961). The works of Michael Drayton. 3. Oxford: Blackwell. p. 338. ^ Benfey, Theodore. Pantschatantra: T. Uebersetzung und Anmerkungen. p. 98. ^ Bickell, Gustav (1876). Kalilag and Damnag. ^ "Mount Qaf - Mythology Dictionary". Damfri, I. 414, ii. 177 seq. Goodman, Steven M. (1994). "Description of a new species of subfossil eagle from Madagascar: Stephanoaetus (Aves: Falconiformes) from the deposits of Amphasambazimba," Proceedings of the Biological Society of Washington, 107: 421-428. Hawkins, A.F.A. & Goodman, S.M. (2003) in Goodman, S.M. & Benstead, J.P. (eds. ): The Natural History of Madagascar: 1019–1044. University of Chicago Press. Pearson, Mike Parker & Godden, K. (2002). In search of the Red Slave: Shipwreck and Captivity in Madagascar. Sutton Publishing, Stroud, Gloucestershire. Spiegel, Friedrich, Eranische Alterthumskunde, ii. 118. Yule, Heny[verification needed] as above.